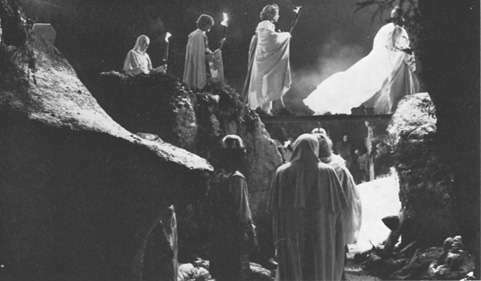 yberberg's monumental and celebrated film about Wagner's music-drama Parsifal was released to coincide with the centenary of Wagner's death. Syberberg made his film entirely in a studio, like his previous films Ludwig: Requiem for a Virgin King (Ludwig: Requiem für einen Jungfraülichen König) and Hitler: A Film from Germany (Hitler: ein Film aus Deutschland). 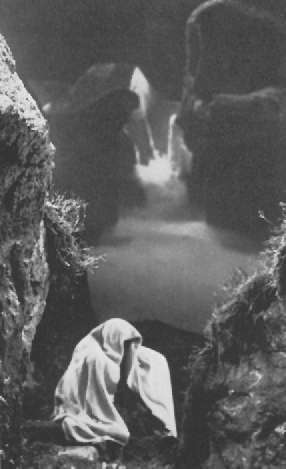 The resources of a film studio allowed Syberberg to film the opera against a constantly shifting screen of references and allusions shown by front-projection, thus imprinting his own vision of Parsifal and Richard Wagner in a manner of which a stage-director could only dream, whilst also having the other advantage of film, that of showing in close-up the emotion of the opera in the faces of his actors and actresses. Right: Scene from H.J. Syberberg's film. ©Artificial Eye. yberberg worked on the project for several years before it could be realised. After completing Hitler: A Film from Germany, he searched for a project that would be, as he called it, less Syberberg . Almost alone among German artists, Syberberg has constantly sought to explain and uncover the romantic and irrational in German culture, now ignored or suppressed because of Hitler, the bitter flower of German irrationalism as Syberberg has called him. Wagner has always been a constant presence in Syberberg's films, both in Ludwig and Hitler (because of their respective obsession and passion for his music), and of course in The Confessions of Winifred Wagner (Winifred Wagner und die Gesichte des Hauses Wahnfried von 1914-1975), where the unrepentant old lady talks on about the good old days at Bayreuth when the Führer made his annual pilgrimage to the shrine. It was inevitable that Syberberg should come to make a film about Wagner himself. His first idea was just that, a film about Wagner, but gradually the Parsifal project took root. He had intended to try to use a recording from a Bayreuth performance as the soundtrack to his Parsifal film, but after the Winifred Wagner film, he was none too popular with the Wagner family, and permission for him to record in Bayreuth was refused. new recording of the opera was commissioned, with the Swiss conductor Armin Jordan, the Monte Carlo Philharmonic and singers of the calibre of Yvonne Minton (as Kundry), Reiner Goldberg (as Parsifal) and Robert Lloyd (as a youthful Gurnemanz). Syberberg wanted the soundtrack to be a separate entity and to use actors who would mime to the pre-recorded track, reasoning that actors were better capable than singers of giving the facial and bodily expression that film demands, and also wanting, for intellectual and aesthetic reasons, the voice to be separate from the body. However, this was not an absolute condition, and so both Robert Lloyd as Gurnemanz and Aage Haugland as Klingsor both sing and act their parts. Left: Kundry asleep, from H.J. Syberberg's film. ©Artificial Eye. yberberg regards Kundry as the centre of the opera, and so chose for the part the outstanding German actress, Edith Clever. Her incarnation of Kundry as variously mother, seductress and penitent has been unanimously praised as a performance of hair-raising intensity. 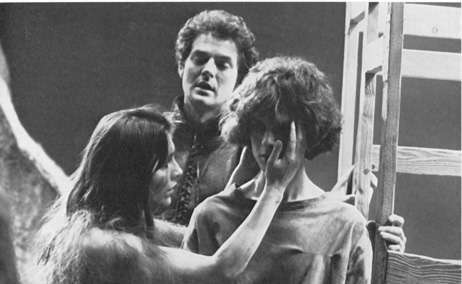 Parsifal himself is played by two people, first a boy (Michael Kutter) and then, after Kundry's kiss, by a girl (Karin Krick), a coup- de- theatre for which Syberberg gives no complete explanation, although he has said that it attempts to render Parsifal as a person with both masculine and feminine poles, which in the final act come together to create a paradisiacal man, an androgyne. He has also said that it counteracts Wagner's depiction of an exclusively masculine redemption. However, even as a device of staging alone, it works extraordinarily well when we hear Goldberg's voice come from Karin Krick, her face radiantly pure. 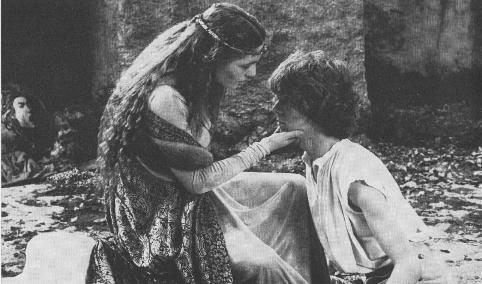 Right: Edith Clever as Kundry and Michael Kutter as Parsifal in H.J. Syberberg's film. ©Artifical Eye. yberberg considers Parsifal to be Wagner's testament, a vision of redemption emerging from his life and his work in music, and so, for Syberberg it is Wagner himself who is the subject in his staging of the opera, together with a century of Wagnerian thought, attitudes and reactions. Because of Wagner's looming presence over German and European culture, the whole of European civilisation is drawn into the film. Syberberg has said, Just as the composer was inspired by a legendary evocation of the Middle Ages in his desire to express ideas which were of his own time, I am basing my approach on the fact that the work is one hundred years old and I can therefore describe its significance through time . 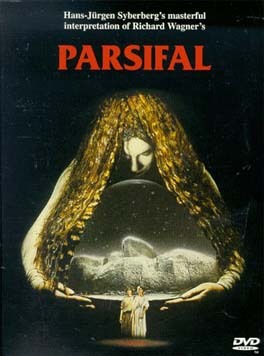 Hence Syberberg puts before us not just a film of the opera, but absolutely everything that Parsifal evokes in him. Whilst the music floods our hearing, Syberberg feeds our eyes with as much as he can crystallise of what effect that music, and that music's very existence, has had on him. Left: Flower maidens, from H.J. Syberberg's film. ©Artificial Eye. he studio set is dominated by a huge replica of Wagner's death mask, becoming a mountain on which much of the action is staged, being Klingsor's tower, the flowery meadow and finally parting in two to reveal (Syberberg's vision of) the Grail. The density of allusion in the film is enormous and too much to comprehend in a single viewing: Caspar David Friedrich, Ingres, Goya, Dürer, Titian, Caravaggio and Bramante all figure in the imagery; the allegorical statues of the Synagogue and Faith on Strasbourg Cathedral are evoked; Amfortas sits on Charlemagne's throne from the cathedral at Aachen; Titurel lies in the crypt of Saint-Denis; scenes from various Bayreuth productions of Parsifal and the Ring appear; the 1882 production of the former is recreated in puppet form during the prelude, with both costumes and faces modelled from photographs; a casement of the room in the Palazzo Vendramin, where Wagner died, is used as a backdrop; heads of Aeschylus, King Ludwig, Nietzsche, Marx and Wagner himself lie at the foot of Klingsor's throne; Mathilde Wesendonk and Judith Gautier are glimpsed among the flower maidens; the approach to the hall of the Grail is down a flag-lined corridor -- a procession, backward in time, through the history of Germany into a world of myth; the destruction of Germany is evoked at the beginning with postcards of the ruins, and we see various puppets of Wagner, including a realisation of André Gill's caricature of Wagner hammering at a human ear. Right: Kundry, Gurnemanz and Parsifal, from H.J. Syberberg's film. ©Artificial Eye. et amidst the plethora of cultural and Wagnerian references and inferences, (a deliberate creation of a world apart, which Syberberg sees as the aim of artistic endeavour) the acting performances themselves are traditional. Although with his constantly changing backgrounds and artificial sets in which Syberberg attains the Brechtian distanciation of a film like Hitler, the concentration of the camera on the performers' faces focuses the attention on the emotion at the heart of the opera. Syberberg often used very long takes, with a complex choreography of camera movements, to keep the attention on the drama, and to avoid breaking up the slow unfolding of Wagner's musical themes by cuts in the images. Hence Syberberg also allows Edith Clever's bravura performance to unfold, so that he lets us experience Parsifal with an intensity and directness not possible on the stage. As the New York Times said, It's as if Wagner's hypnotic allure and Brecht's intellectualised alienation have been somehow mystically unified . In this immensely ambitious work Syberberg presents Wagner's life, music and thought. He also presents a critique of those same things, whilst mounting a sumptuous and resonant production of the opera that is a feast for the eyes and ears, a true Gesamtkunstwerk, or, as Newsweek said, The film performs the extraordinary feat of both splendidly presenting and forcibly challenging a consummate work of art . recurring element of this film is movement in procession. Indeed, processions of knights are required by the score and Syberberg makes the most of these. Their first procession is that which follows Amfortas down to the lake and back again. In the Grail Temple, the knights march with their weapons and relics, such as chalices and even a statue of the young Parsifal, and the pages bear the bleeding wound. In the third act, this march becomes a procession of the living dead. Syberberg introduces other processions too, not required by the stage directions. Such as the pages with the dead swan, or the group that searches for and brings back the Grail, an enormous rock in the shape of a platonic solid. Where a stage production of Parsifal would be static, Syberberg introduces purposeful movement, with the camera also moving with the procession. In the transition scene of the first act, we follow Parsifal and Gurnemanz through a maze: moving in space, they seem to move backwards in time from the present, passing through the Nazi era on the way. In the transition scene of the third act, the path to the Grail Temple seems to pass through the sky. Left: the procession of the knights in H.J. Syberberg's film. ©Artificial Eye. ne of the themes that repeatedly is heard through the many layers of Syberberg's film, like one of Wagner's Leitmotive, is concerned with relics and fetish objects. The story of Parsifal seems to have been written down for the first time in the twelfth century, an age in which relics were a focus of religious devotion. These relics could be the remains of saints, or objects associated with them, or even with Christ himself: fragments of the True Cross, or phials of the Blood that was shed on that cross. Crusaders and pilgrims returning from the Holy Land brought back with them new objects of veneration, to be preserved by Christendom: such as the blade of the Lance that had pierced the side of Christ. Poets began to tell of one relic that surpassed all of these: the mysterious Grail. Syberberg shows us the Grail in its many forms: a chalice carried by a beautiful maiden, or a stone that fell from the sky. At the end of the opera, the true Grail is revealed to be none of these, but the union of male and female in the paradisiacal man. mfortas's wound too seems to be a religious relic, or perhaps a fetish object. The bleeding wound has become separated from Amfortas and pages carry it on a cushion. When the swan is killed by Parsifal, the Grail community immediately turns it into a relic. As they decay and fossilize, the knights try to preserve each other, bizarrely, in polythene sheets. There is a stench of decay. Syberberg seems to be saying something about the futility of trying to preserve the past, when we should be living in the present. At the very end of the film, Kundry shows us the greatest relic of all: preserved under a glass bell like an object in a museum, she cradles the Festspielhaus.